Canadian metal veterans ANNIHILATOR have released an extra-gory, NSFW (not-safe-for-work) video for the song “Pieces Of You”. The track is taken from the band’s sixteenth studio album, “For The Demented”, which will be released on November 3 via Neverland Music/Silver Lining Music. The effort will be available in a limited-edition digipack with lenticular cover, a jewel-case CD, a twelve-inch 180-gram colored vinyl in gatefold and digital download. “The following contains a graphic interpretation of a true crime story that includes potentially disturbing images and lyrical content,” says ANNIHILATOR‘s Jeff Waters abut the video. “We realize this is not exactly the most pleasant subject to write about, however, in the world of being a writer and musician, sometimes these stories can spawn a song! While many of the songs from the new album, ‘For The Demented’, have positive messages in them, this one does not! Waters adds: “This is about a criminally insane guy who murdered his ‘annoying’ girlfriend to ‘silence’ her voice. He then eats pieces of her, as a means of keeping her alive inside of him. Yeah, crazy, but when you watch horror movies, crime shows and own a few CANNIBAL CORPSE t-shirts, this is tame in comparison. “I like the three dimensions of this: seeing the lyrics roll by: hearing/feeling the music and watching the horror… almost difficult to take it all in, in one view. Pre-orders are now live at this location. Waters didn’t venture back alone while looking back through ANNIHILATOR‘s history. “I was well aware that trying to re-capture the past usually fails, or at least won’t come close,” he says. “So, I decided to bring in fresh ears, both musically and physically with Rich Hinks, my bassist for the last few years. And doing most all of the records by myself, including writing and playing most all on my own, as well as mixing, mastering, engineering, etc… well, it can become routine and can often hinder you from being objective and more creative. Jeff continues: “Bottom line, ‘For The Demented’ captures some feel from ANNIHILATOR‘s 1985-87 demos mixed with the first four ANNIHILATOR records. Back to the thrash-meets-melody but with some pure Waters guitar riffing, upgraded lead guitar shredding and vocals back to the demo days meets the ‘King of The Kill’ record. Lyrically, I placed a theme on the record: the human mind and all of its glory, complexity, diversity, weaknesses and insanity! Pretty much the craziness of the music is matched by the lyrics. 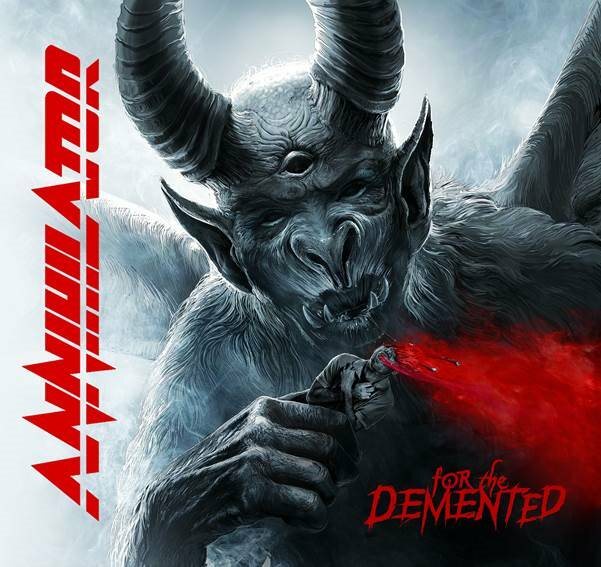 “I think metal fans are going to hear much of what they have been waiting for from ANNIHILATOR,” adds Waters. Since 1989, ANNIHILATOR have not stopped putting out records and touring the world. Despite the ever-changing climate of the metal world (and releasing a series of “different” metal records with various lineups along the way), Waters and company have consistently delivered strong albums since the band’s debut, “Alice In Hell”. Then there was 1990’s best-selling “Never, Neverland”, 1995’s “King Of The Kill”, “Schizo Deluxe” in 2005 and many other critically acclaimed releases up until “Suicide Society”. The “under-the-radar” influence of this band, and Waters, has been felt throughout the entire realm of the metal world by a ton of well-known musicians and bands; that influence even stretching into the hard rock and instrumentalist genre.